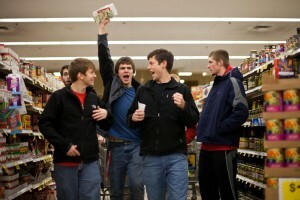 Grace College students will again join with a local church to help provide food for the hungry. Grace College and Mission Point Community Church, Winona Lake, Ind., are partnering with Owen’s Supermarket on East Center Street in Warsaw, Ind., to host the third annual Super Market Sweep: Give ‘Till You Drop event on Wednesday, November 20, an all-day event. The Super Market Sweep is a day for Warsaw community members to come together and give back to area families in need this season. Members of the community are invited to go to Owen’s Supermarket and shop for as many non-perishable food items as possible. Volunteers will be present to pass out a list of needed food items and collect the purchased food. After all the food has been collected, it will go to replenish the pantries of Combined Community Services, Our Father’s House, and Salvation Army. Baby formula and diapers will be given to Heartline Pregnancy Center. Financial donations have been provided by Mission Point Community Church, Grace College, DePuy Orthopaedics, Silveus Insurance, Nextremity Solutions, and Wildman Uniform. A special thanks to Owen’s Supermarket and their managers for being willing to host this shopping spree. Plan to join in on the generosity and make a difference by giving this year. Come shop the Super Market Sweep on November 20! For more information on the Super Market Sweep, Give ‘Till You Drop event, please contact Jamie Koser at: jamie@missionpoint.net.